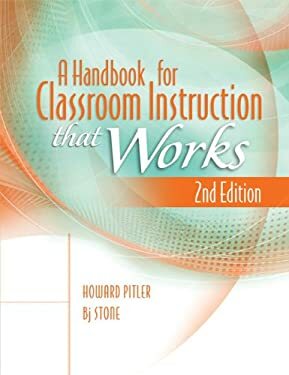 This new edition of A Handbook for Classroom Instruction That Works will help you explore and refine your use of the teaching strategies from the 2nd edition of Classroom Instruction That Works . Discussion of the nine categories of strategies that have the most positive effect on student learning is supplemented with the following: * A detailed explanation of the strategy, including why it has a positive effect on student achievement, how it fits within a high-quality instructional plan, and what research indicates is best practice for its use. * Reflection questions that help you consider how and why you currently use the strategy. * In-depth classroom examples that help you see how the strategy is supported by and supportive of other strategies in a well-designed lesson. * Teacher rubrics and student checklists that can be used to measure the effectiveness of your instruction and how it improves student learning. * Tools, templates, and protocols that help you assess your current practice and build a professional growth plan. Perfect as a guide for self-study or professional learning communities, the handbook is designed to help you begin using effective instructional strategies immediately. Although implementing any of the ideas in this book can benefit your students, the power to help your students excel is found in intentionally using all the strategies together. With this handbook, you'll develop your skill in coordinating the strategies and learn how to more effectively use them to help students get more out of every lesson. New (20 available) BRAND NEW. Over 1.5 million happy customers. 100% money-back guarantee. Make your purchase count: support Better World Books' worldwide literacy partners.